Debatosh Guha is a Professor in the Institute of Radio Physics and Electronics, University of Calcutta, India. He is also associated with the department of Electronics and Electrical Communication Engineering of the Indian Institute of Technology Kharagpur, and served the same as HAL Chair Professor. He received the B.Tech and M.Tech degrees from the University of Calcutta in 1987 and 1989, respectively and started his career as Project Engineer in Webel Telecommunication Industries Limited. After graduating with a PhD in microwave engineering from Calcutta University, he joined the same University as an Assistant Professor in 1994. He spent about 2 years with the Royal Military College of Canada, Kingston, Ontario as Visiting Research Professor working largely on the developments of various low profile microwave and wireless antennas. He has researched in developing microstrips and low profile dielectric resonator antenna technologies. DGS-inspired antenna is one of his major areas of contribution. 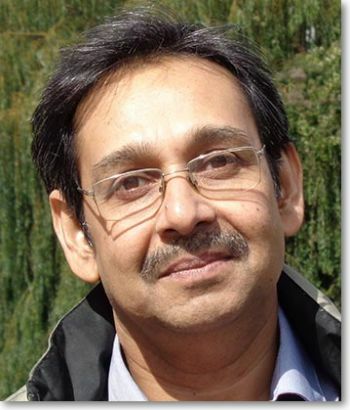 He has published over 200 papers in top Journals and Conferences along with a Book entitled ‘Microstrip and Printed Antennas: New Trends, Techniques and Applications’ Wiley, UK, 2011. He has developed novel antennas for a North American wireless industry, which have been commercial product (Z1900) since 2007. Professor Guha is Fellow of the Indian National Academy of Engineering (INAE), The National Academy of Science Indian (NASI), and West Bengal Academy of Science and Technology (WAST). He is a Senior Member of IEEE and recipient of some notable awards which include Raj Mittra Travel Grant Award of IEEE AP-Society, Chicago 2012; URSI Young Scientist Award, Lille, Franc1996; and Jawaharlal Nehru Memorial Fund Prize, India, 1984. He is now an Associate Editor of IEEE Antennas and Wireless Propagation Letters. He has served IEEE Kolkata Section as the Chair (2013-2014) and Vice-Chair (2011-2012). He also served IEEE AP-MTT Kolkata Chapter as the Founding Chair (2004), Vice-Chair (2007-2009), and Chair (2010-2011). He conceptualized and initiated two flagship biennial and annual IEEE sponsored Conferences in India: IEEE Applied Electromagnetics Conference AEMC in 2007 and IEEE Indian Antenna Week IAW in 2010, both being regarded as highly prestigious EM and Antenna events in India. He has been instrumental in earning the credibility of both the events over last 8-9 years. He has been associated with the organisation of many other international conferences including EUCAP 2014 as Asia Liaison, EMTS 2013, and APCAP 2012. His current research interests include DGS for advanced antenna design, unresolved issues of microstrip antenna design, exploring unconventional modes for Dielectric Resonator Antenna (DRA) designs, wideband and ultrawideband low profile DRAs, and high gain antennas for wireless industry.